A Bigger Boat chronicles the Albuquerque Slam Poetry scene's growth and success at the 2005 National Poetry Slam competition, which it hosted and won. 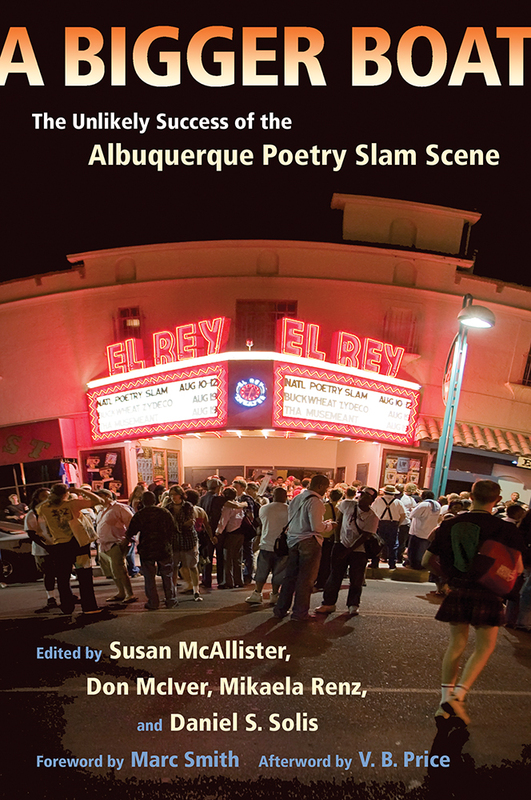 This collection of poems and personal memories explores Slam from the voices of the poets who began developing the Albuquerque scene in 1990 to poets who witnessed and celebrated the 2005 hometown victory. Despite Slam's big city origins and arguments that smaller urban areas could not garner enough community interest to host national events, the Albuquerque event proved skeptics wrong. The swell of excitement so exceeded expectations that Danny Solis urged fellow organizers, "We need a bigger boat!" The editors of A Bigger Boat gathered the works of well-known local and national poets to provide a window into the world of competitive poetry, where verse meets performance. A CD with performances by many of the poets recorded at Albuquerque poetry slam events is included. Susan McAllister is the director of the Harwood Art Center in Albuquerque. She headed the fundraising committee for the 2005 National Poetry Slam and was a founding member of the International Poetry Institute. Don McIver is a performance poet who first started performing his work in Denver in the late 1980s. McIver hosts and produces KUNM-FM's "Spoken Word Hour" and is co-producer of "The Poetry of Vietnam" and "Slam: Literary Fad or Movement." Mikaela Jae Renz has been the mentor for the Voces Program since it began in 2002. She received a B.A. in English from the University of New Mexico and works as a community planner in Albuquerque, New Mexico. Daniel S. Solis has been writing and performing poetry for twenty years and holds numerous national and international Slam titles. Solis was the Artistic Director of the National Poetry Slam 2005 in Albuquerque and recently founded the Youth Poetry Corps.